We spent a fantastic afternoon touring York with Michael! He was very experienced, knowledgeable, friendly, punctual and prepared. We learned a lot and felt like old friends by the end of the 4-hour tour. We would highly recommend hiring Michael to anyone traveling to Yorkshire. We could not have asked for a better guide than Michael, who spent about 4 hours showing us the sites of York. We visited Yorkminster, the Shambles and most all other not-to-be-missed sites in York. Highly recommend Michael. Michael provided us with a custom 9-hour tour of James Herriot country in the Yorkshire Dales region. He was magnificent! Michael picked us up at our B&B, was very well prepared in advance, took us to multiple unique locations of interest, and even sang the theme to the James Herriot TV series! We were exceptionally pleased with the attention to detail and accommodation provided by Michael. The day made for a life-long memory of our first visit to England. Thank You, Michael! Don & Mary, USA. Michael a fantastic guide. He really went out of the way to make sure I maximized my time in Yorkshire. He is wealth of information. An excellent experience. Even introduced me to the world's packaged cookies. Fantastic guide - will recommend to anyone visiting the area. Michael was a fantastic guide, he created a sense of adventure in our tour. I would recommend Michael B. to anyone. Great job Mike....there's not much about York that you don't know.! We spent a lovely day with Michael. He was informative and highly entertaining. Michael is a very good guide who knows his history and appreciates it very much. His descriptions are thorough, and he makes sure you do not miss things other tourists might miss. He also takes you to sites others may miss. Michael was very informative on numerous subjects related to the city of York and kept us totally engaged during the entire tour. Additionally, Michael was very friendly and easy to be with. Michael's knowledge of the history of York, including even the lineage of archbishops listed in the minster, was extremely impressive. He selected just the right places to visit to give us a very good idea of the history and essence of York in a half-day tour. He was obviously well known to the locals--even the "purple man" in the middle of town who was raising money for Syrian refugee children. He was also very helpful in advising us on train schedules from Leeds to York. Michael gave us two wonderful days in York. His knowledge of local history and legend, and his good humor, enriched our travels. We would recommend him highly. Michael was friendly, humorous and knowledgable. We enjoyed how he included us by asking questions and making us think about what we were viewing. Also, he let us help him in choosing what we wanted to see. Delightful tour!!! Michael was very versatile and adapted his itinerary according to our interests; his factual knowledge is extensive and wide-ranging. He is personable and diplomatic, our experience was like taking an energetic walk-about with an enthusiastic friend. Mike is quite an unforgettable guide. He goes the extra mile to make sure you get the most out of your day. Though he often works with large groups, he maintained his same high standard of professionalism with us on our private tour. He made sure we had all our basic needs met, stopped at places of interest along the way, and was full of all sorts of fun, informative tidbits. Our interests were particularly literary, so being well versed in that area, he was the perfect guide for us. A great choice! Michael was an excellent tour guide, going far beyond what we would have expected. He was knowledgeable, energetic, kind, and generous with his time. Great sandwich-maker also! We would definitely take a tour with him again. Michael was knowledgeable, flexible and generally a great guy who helped me have a wonderful Richard III tour. Michael was a terrific guide - friendly, funny, informative and helpful. As we travelled from Australia and had limited time, our day trip from Leeds with a local guide to explore Bronte Country was just what we were looking for. Michael was knowledgable, fun and flexible. He knew the history, the people, and the literary associations of York. And he knew a great place for lunch. We were a party of 2 older adults and two younger adults, and we all enjoyed Michael's guidesmanship. We were fortunate to have as our TourByLocals in Yorkshire, England Michael, a seasoned and very professional guide, whose knowledge and familiarity with all the Manor Houses we wanted to see made this the highlight of our trip to England. He was professional, punctual, a safe driver and a delightful and very helpful guide. I do a lot of foreign travel and Michael was one of the most charming and courteous guides e have ever had in our 40 years of traveling all over the world. Michael was a wonderful guide for our day in York. It was the Friday before Easter which limited our times and itinerary. However, Michael worked around the church services and other interruption so we did not miss a thing. I also want to mention that I was traveling with my elderly Aunt who needed periodic breaks from walking and Michael was extra considerate of her special needs. Although we were exhausted at the end of the day, it was a good exhausted. I highly recommend Michael. Mike B was the best guide we could have asked for. He listened to our requests and fit everything in to the schedule, plus some added bonuses. He spent a good deal of his own time researching information for us and went the extra mile to ensure we were happy. I would absolutely recommend Mike as a guide. His energy, humor and knowledge of the area was abundant. We had a wonderful time and Mike is responsible for a fabulous vacation. Thanks Mike! Mike is a superb, well-informed, sensitive, and flexible guide. We enjoyed his commentary and humor. He provided us with exactly the tour that we were seeking. We hope to have the opportunity to tour with him again. And did I mention the ice cream? Michael was very knowledgable and very helpful. He even picked us up at the train station, and then took luggage to our hotel. He was very flexible and geared the tour to our interests. Guides like Michael make us want to use ToursByLocals again. This custom tour was splendid. I will remember this day, cherishing the special surprises, views, history, and insights. Mike pointed out many hidden architectural, museum, and market treasures I would have missed on my own. The stories about the Millennium Gardens and tea in Leeds Library were special treats. It was a perfect combination of city walking and driving to see Kirkstall Abbey, the Adel parish church (an exquisite Norman church built around 1150), and the dales in the countryside. I booked this tour for very good clients that were very interested in York - this was part of a 22 day trip to the UK and this was their favorite tour. Michael could not have been more knowledgeable, helpful or nicer. I will be booking tours with him again. What can I say. Our guide, Mike , was fantastic. He had intimate local knowledge, as well as a sharp wit-to match my own. I could not recommend anyone higher. A highlight was making snowballs just south of Hawes in the Dales-in the middle of May!! Again, if you're looking for a great guide, Mike's the one to use. A wonderful tour. 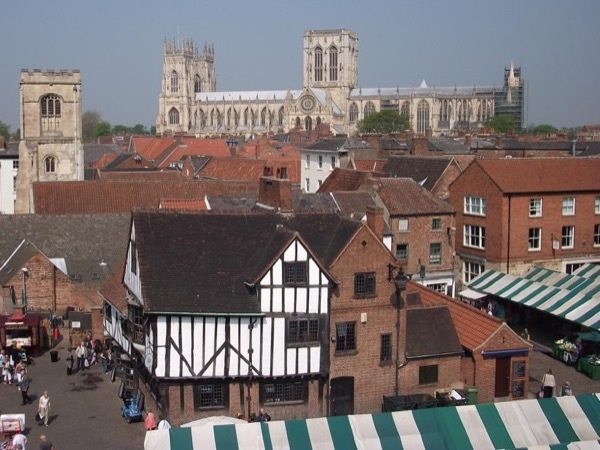 We booked 2 half days and one full day, and were provided with 2 almost full days and one very full day of extremely pleasurable tours and information in York and parts of Yorkshire. Our guide, Michael, was friendly, knowledgeable, enthusiastic, good humoured and accommodating. We highly recommend him and his services; if you are looking for a guided tour in this part of the world you cannot do better. Michael did quite a bit of research ahead of time for my tour. Because of his willingness to customize my visit to cover the special items I wanted he made my experience just what I had dreamed. Each part of the 12 hours we were togehter were filled with the history of Leeds and the surrounding areas where generations of my family have called home. A job well done. I really enjoyed the tour that Michael provided. It was customized to my needs and interests. Michael is extremely knowledgeable about the Yorkshire area, and I found the day very interesting and fulfilling.